I don’t have enough green in my life. I don’t get out enough, I forget to put plants in my house (and they aren’t much fun if small boys tend to pull them over anyway) and there isn’t the budget for cut flowers either. I’m so grumpy that I don’t live somewhere lovelier that I probably do lose out on the outside I do have. There isn’t a green room in my house. There is a sage green, but I forget to go in it and I’m about to turn it sunshine yellow. So when I looked around my – blue – bedroom yesterday, I wasn’t expecting to find inspiration for green. What does green even mean to me? It’s a garden I haven’t made beautiful. A Dartmoor I don’t live in. Trees that sometimes make me smile, but it is always a wistful smile. This week it is also a yarn I have run out of. But it is also the colour I assigned to Bene back when he was a hope of a bump called Marmite and it is a colour my husband always chooses when we play games. And, so it turns out, it was the dominant colour in the heap of tat that is on my chest of drawers, dumped in passing by children, picked up off the floor to save sleepy midnight feet. 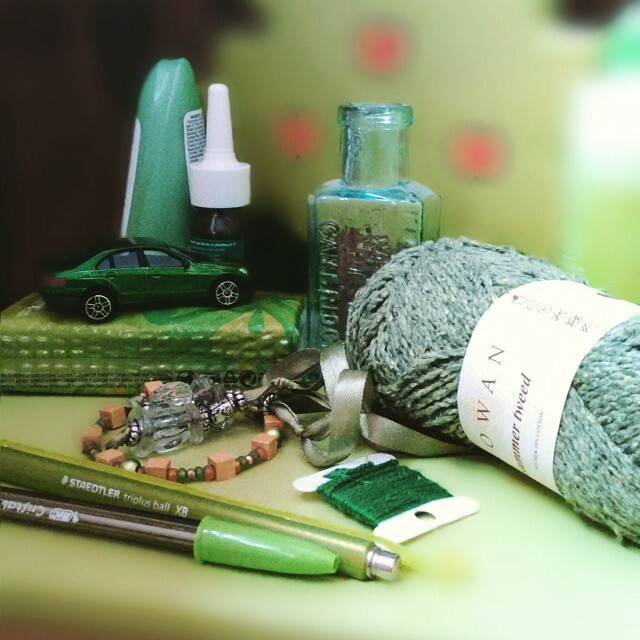 Random assortment of green from my chest of drawers. The yarn is ready for an April peace mandala crochet project, the pens come from a rep who has become a friend and who I love like an uncle, the thread I wound on to that card when I was pregnant with Freddie. The bracelet I made on a holiday with friends when I was pregnant with Freddie. The bottle was sent by a kindly brand after I lost my CybHer bag.The bookmark comes from my dad in Egypt. The cold remedies and tissues sum up the last few weeks, the tree is Josie’s and there is a faded out bottle of fabric blue, a deodorant that I altered to from spray after my breast lump scare last year. And a little green car, one of the most precious possessions of one small boy. This post is for The Gallery, on the Sticky Fingers blog.